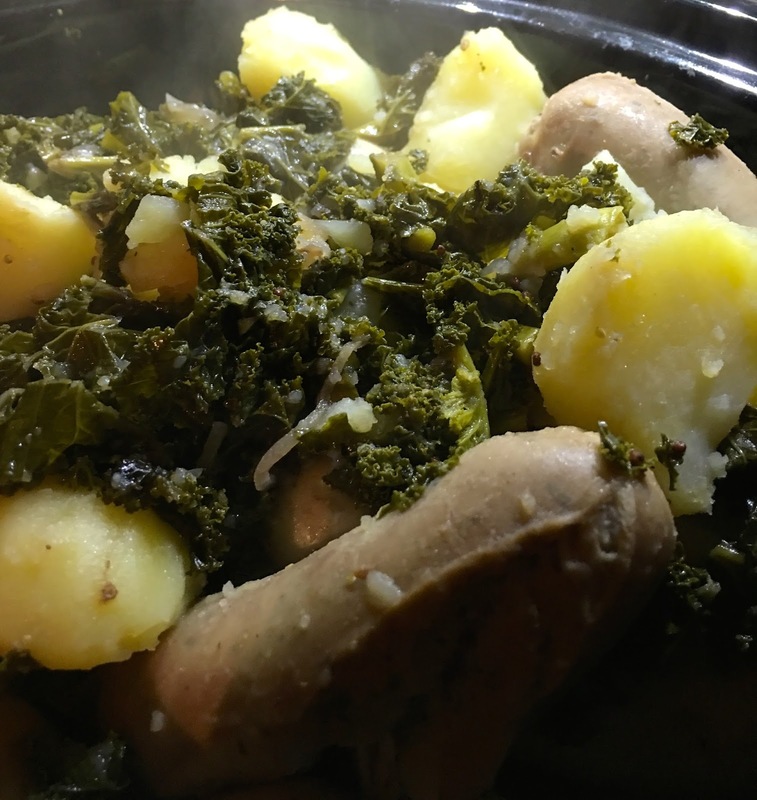 When I was visiting my friend in Germany recently she introduced me to this classic dish, traditionally enjoyed after a long winter hike and lots of Schnapps. It's one of those hearty dishes which tastes better than it looks! 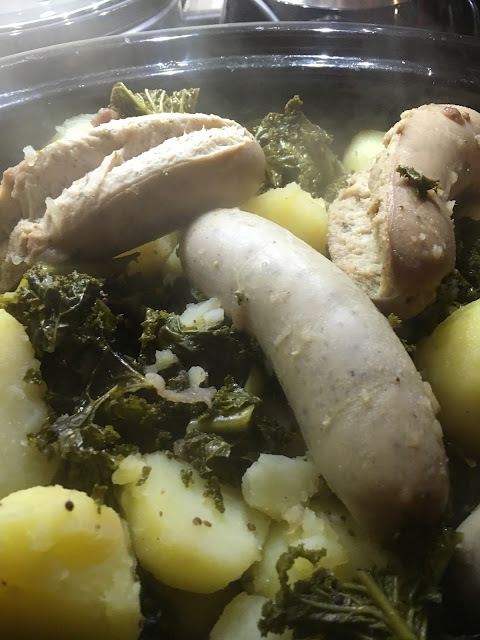 Back in Blighty I wanted to recreate the dish for friends but could only find German recipes using ingredients I could not easily source in England. After some trial and error I think I have managed to create a worthy British version of the North German speciality. 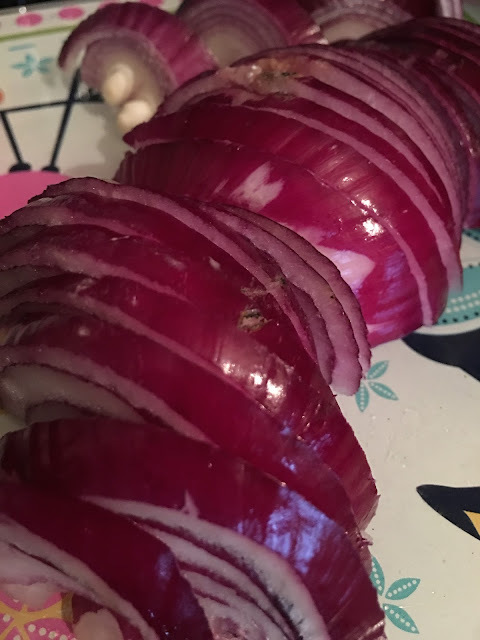 I have also converted it into a slow cooker (crockpot) version as I think it's the perfect dish to prepare well in advance while you get on with Christmas shopping, winter walks or just want to relax without hovering over a hot hob. I bought mine ready chopped in a bag from the supermarket. You can also use frozen or canned. Most Germans seem to prefer using the canned stuff! 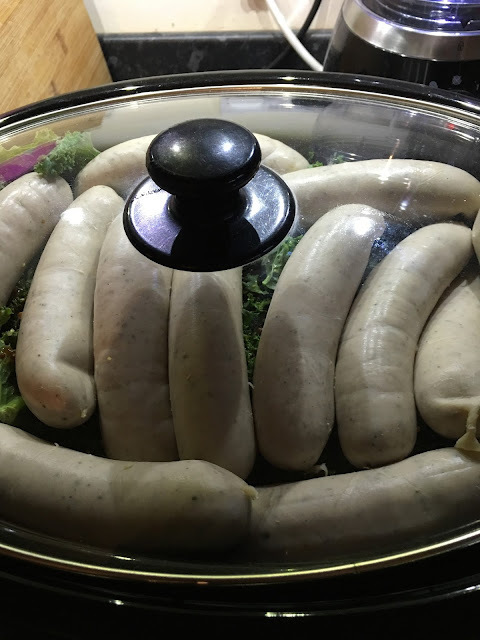 My German friend used special smoked and unsmoked sausages from her butcher. In years gone by the dish contained sausage made from brains! 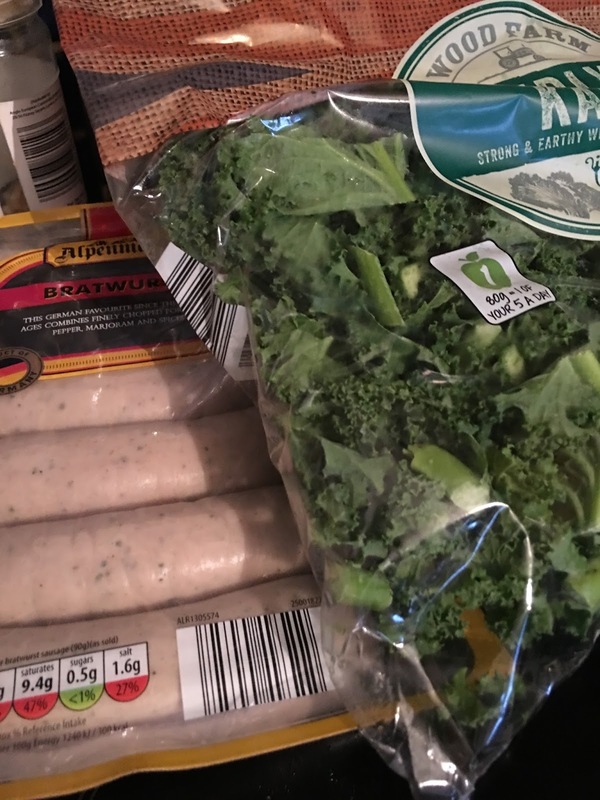 I used Bratwurst (available in most British supermarkets now) or you could use good quality British sausages and add them as you serve. You could also use good quality frankfurters. 1 pear per person, peeled, cored and cooked. optional cranberry or lingonberry sauce to serve. Add chopped kale with stalks removed into slow cooker. Fry bacon, set aside, fry onion in bacon fat or oil until softened. Add bacon, onion and fat to Kale. Combine beef stock, garlic, mustard and mesquite flavouring then pour over kale. Prick Bratwurst sausages (otherwise they will split as in the pic below!) and arrange on top of kale mix, trying not to let them touch the sides of the crockpot at this point (they will stick and burn) UNLESS using British sausages, in which case they will need to be cooked separately just before serving and added when plating. Cook on high for one or two hours then low for 5 hours (depending how hot your slow cooker gets). Frozen or canned kale will take less time - probably 3 hours but to produce tender kale which is not bitter, the longer it's cooked the better. Stir occasionally to make sure the kale doesn't dry out on top. 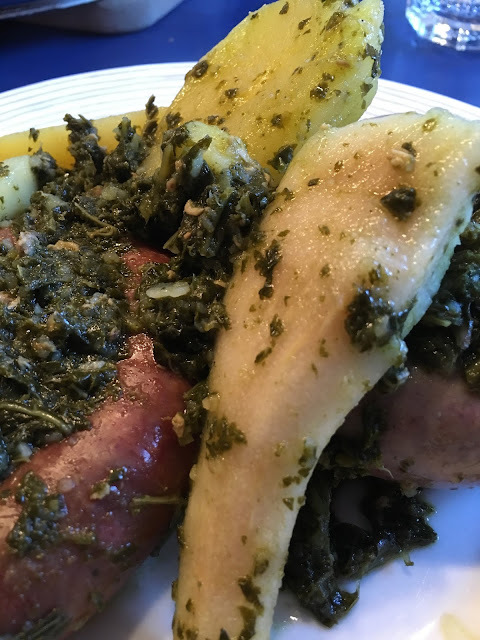 About half an hour before serving add boiled potatoes and carefully mix together with Kale and sausage so they absorb some of the tasty juices. To prepare pears I just cored and peeled then microwaved in a container with a loose lid for 2 minutes with 1 tsp water. Serve: there's no pretty way to do this but aim for kale, pear and sausages underneath, lingonberry sauce on the side. I've made this twice and both times was so keen to eat it I forgot to photograph the end result so you will have to make do with a picture of my friend's German version!